It’s only been a couple months since I was last in Vegas, but I had some meetings to attend so it was time to return. Though I thought about driving, I thought better of it and bought plane tickets instead. Both flights were fine, though there were a couple things that nagged at me on both flights. On the way out, I was surprised to see Southwest had nothing going to Vegas at all that day. JetBlue, however, had a ton. I picked a flight for $94.20. On the return, Southwest’s one flight was timed right, and that cost $141.98. When it came time to fly, I left home an hour before departure, made it through security quickly, and was instantly mesmerized by this beauty in front of me. Something about the retro airplane, the ground-level boarding, and the laid back vibe of the Long Beach Airport just made it all feel so right. That wasn’t my airplane, however. I marched down the last gate, 11, and waited for boarding. Things were busy with all the gates being used, it seemed. I parked myself in an area at the far north end of the terminal with a bunch of seating, but you can’t really hear the announcements very well from there. I gave up after a bit and walked up to my gate to see if it was time to board yet. I was in group C, and indeed, it was time. My airplane was also a special. This is the one dedicated to the New York Fire Department. I walked up the ramp and got a couple rows back before stopping. There was some seat confusion up ahead with a woman telling the guy sitting in 11C (exit row) that he was in her seat. I couldn’t see what was going on, but he finally got up, walked a few rows forward, pulled down his carry on, looked at his boarding pass, and then said “I’m in 10A.” The odd thing is that he looked confused, as if he thought he had been in 10A all along. Eventually he moved to the real 10A and had a long goodbye with his friends who were now right behind him in 11A and B. It was weird, but just wait… this gets weirder. The crew seemed in no hurry to push back on time. A minute after scheduled departure, the pilot came on and said a) it’s windy in Vegas so the cabin would be buttoned up early, and b) we’d leave soon. We did finally push back 8 minutes after departure. Once in the air, the flight attendants said they’d be doing an express beverage service, but they never got to us. I actually never saw anyone handing out drinks at all, but I did see one flight attendant walk through the first few rows with snacks before turning around. The people in my row had their tray tables out and they were clearly annoyed that they didn’t get served anything. I felt the same way, especially since the seatbelt sign was off at altitude and there was plenty of time to at least fling a snack and a water bottle at everyone. The flight attendants did clean up a bit early, but it was smooth almost the entire way down. It didn’t start getting bumpy until after we had done the turn near Lake Mead and started heading back west to land. Once we got to the gate, I noticed that the people in row 11 (the friends of the guy who didn’t know his seat) had put blue gloves on and had started to clean the airplane. So, wait, were these employees?! The idea that an employee or even a friend of an employee would play seating games like that and delay boarding is, well, something else. I went into the airport and found a nice place to work while I waited for a friend to arrive. That didn’t happen thanks to a nasty 3+ hour delay, so I headed to the hotel for the weekend. The next day, I received a nice surprise in the form of a $15 voucher from JetBlue for my TV not working. But, um, it was working. So I have no idea why that happened. On Sunday, I was awakened by a delay notification. Ugh, every time I fly to Vegas, it seems like the airline gods are telling me I should have just driven. But soon after, Southwest found a new airplane and we were back on time. Sweet. I went with another person to the airport a couple hours early. Since it was a Sunday afternoon, I wanted to leave plenty of time. Apparently that was silly. The line for security at the A/B gates had maybe 5 people in it. There was no dedicated Pre Check lane even though there was a dedicated ID checker. I will never understand how Vegas security operates, but at least in this case, it operated quickly. On the other side, we had so much time to kill, we just walked up and down the concourses. My friend finally went on his way to his gates, and I took a seat at mine. A small creeping delay had snuck in since the airplane had been hung up in LA for a few minutes. I took the time to catch up on the phone with a friend and observe that it really did look pretty empty. I wonder if the shooting in Vegas has had an impact at all. Our airplane did pull up, looking all fancy in the new colors with those super-cool split scimitar winglets. People slowly got off, and despite the late arrival, there didn’t seem to be any hurry in getting us boarded quickly. I’ll never understand that lack of urgency when it could have put that airplane back on time. I had pass B14, and the gate agent announced we’d only have 115 people onboard the flight, so we would have room to spread out. I walked on to find my fate. The front of the airplane was fairly full when I got on, but I found one of my favorite spots open – row 10. Why do I like row 10? It’s in front of the exit row so it can’t recline. I never recline in coach on flights anyway, so this doesn’t matter to me. But on a flight that’s not completely full, the middle seat in that row is going to be one of the last to go. I sat and hoped for the best. Sure enough… empty middle. Sure enough, as we took off westward, it was bumpy. But thanks to the winds, we were climbing fast, and it was just a few minutes before we were up into smooth air. The flight attendants jumped up and took drink orders while slinging honey-roasted peanuts. Unlike on my way in, these flight attendants got everyone, and they had a ton of time to spare. It wasn’t long before we were passing Big Bear again. You guys liked the photo last time, so here’s another one. The pilots told us that air traffic control had slowed us down a bit. I didn’t mind as I had flipped on my phone to watch the end of the first half of the Cowboys/Chiefs game. There were some low clouds that framed the peaks of the Santa Ana Mountains quite nicely as we descended. The clouds mostly parted when we got into the LA Basin, and we had a nice view as we glided in for a greaser of a landing. I was able to continue watching TV until the half ended just before we got to the gate. Then I got off and headed home. The outbound employee seating thing sounded weird, I would have written a complaint about it just to see what the airline had to say about it. The not being served anything when it seemed they could would get a complaint about. Maybe that was the reason for the voucher. Correctly and officially, it is the Fire Department of New York. FDNY. I had a similar issue with Jetblue crewmembers flying on a pass and messing with boarding. Going SEA-JFK last June an F/A boarded with her ten…TEN…companions travelling with her, at least 5 of them small children. They were all sitting up in the front 6 rows near me, and spent 10 minutes shuffling children around, blocking the aisles, and rearranging overhead bags. Very frustrating for the flight crew, who were trying to push early for the red eye, the other 150 people waiting to board behind them, and the passengers who were already seated and constantly badgered by the flurry of children being shifted around. I love Jetblue, but they need to have a chat with their crews about how they act when flying off duty. Only the Crankster would have been up on the fact that the 7/25s in LAS would have been renumbered as 8/26! I had to check the Jep chart to confirm this. When did this happen? 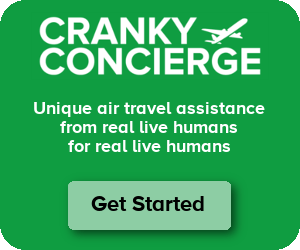 Oh, and your description of the seat numbers filled by the rogue non-revving JetBoy employees will probably be enough to get them taken down a notch for their behavior, assuming corporate reads crankyflier.com (you know they do–every day). Oldiesfan – Looks like it just happened in August. That ‘retro’ Jet Blue plane is a beauty, indeed. I hope one of these days I’ll happen to cross paths with it. Why can’t other carriers create great liveries like this? Of course, they can… but they choose instead to do variations on the boring Eurowhite look, knowing that most passengers don’t care. While I’m no Southwest apologist, and am not saying they’re “perfect” or even ideal in cases, I MUST say that I’ve never understood the hype that surrounds jetBlue. In my limited experience with them, I was NOT impressed, in the least. To the point that I’ve avoided them since. I was under the impression that they considered themselves the classy carrier, sort of the everyman’s Virgin America. But I found them to be more akin to Southwest meets Spirit. Trip reports like this don’t lead me to change my mind any! As someone who use to fly for JetBlue, I totally believe your account. In my experience, the non-revs who are not FA or Pilot commuters (and therefore aren’t as experienced with non-revving) were the absolute WORST.